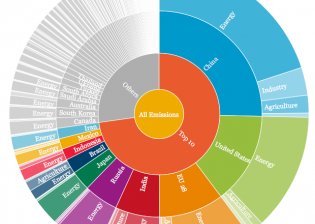 ALL THE WORLD’S GREENHOUSE GAS EMISSIONS IN ONE INTERACTIVE CHART | "Global Possibilities"
In 2012, the world emitted 42,386 megatonnes of greenhouse gases. Here’s how that number breaks down. Alison Kanski is a journalist and graduate student at the City Universitty of New York Graduate School of Journalism. Follow her on Twitter @alisonkanski.